This sauce is very basic and very good. It makes exactly enough to cover the coconut flour pizza crust recipe. It would be very good with additional veggies pureed in, such as zucchini or leafy greens. Heat the fat or oil in a large skillet. Chop the onion finely in a food processor, then add to the hot oil and saute for about 5 minutes. Puree the tomatoes in the food processor and have them ready. Stir in the seasonings and add the crushed garlic. Add the pureed tomatoes and stir thoroughly. Add some salt. Let the sauce simmer for about 1-2 hours to cook down. Once the sauce has reached it's desired thickness, remove from heat, adjust the seasonings, and use on your pizza! 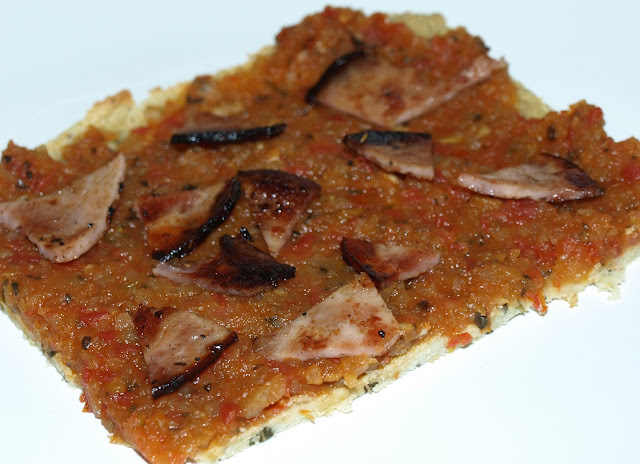 Hazelnut pizza crust recipe, or seed crust recipe. I make a low carb pizza crust out of all eggs and cheeses that the husband adores. Let me know if you want the recipe! Yes, please share! That sounds really good!